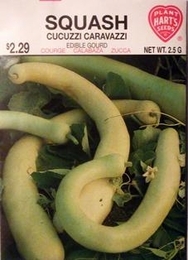 An Italian delicacy, Cucuzzi is a summer squash that is prepared in the same way as other summer squashes. The flesh of young fruits is thick, tender and of exceptional flavor. Fruits left on the vine to mature will be a distinct novelty in the garden. Well-rotted manure mixed into the bottom of each hill will stimulates growth and increase yield considerably. Seed spacing - 3-4 seeds in a ring about 2 inches across.